It was a little bit of hell on earth. With searing heat in the triple digits replacing May gray and fires sprouting up all over the county, San Diego’s mellow vibe turned menacing last week. As many of us, this author included, worried about the safety of friends and family members in harm’s way, it was hard not to be struck by a painful sense of déjà vu. We’ve been here before—three times in a little more than a decade. But not everybody felt that way. Upping the ante on Horn’s uninformed speculation, the far right fringes of the Internet jumped straight to conspiracy mode, sounding the alarm that our most recent firestorm could be the act of Islamic terrorists. As of this writing, investigators questioned and released one man, caught two teenagers in Escondido trying to set copycat blazes and arrested another man (not named Mohammed or Abdul) not for setting but for adding fuel to a fire in Oceanside. Meanwhile, Cal Fire has determined that the first big blaze, the Bernardo fire, was accidentally sparked by “powered equipment use”. As arson speculation captured the imagination of a good number of folks on the TV news and across social media, the Voice of San Diego published a solid piece noting that 95% of wildfires are not the product of arson. Nonetheless, the tendency to focus on the criminal investigation rather than the bigger picture persists. Indeed, it may be easy for most reasonable San Diegans to dismiss the paranoia of the far-right when they posit a terrorist conspiracy to burn our county, but the arson narrative in general is attractive because it allows us to escape the far more disturbing possibility that San Diego burning is not an aberrant condition brought upon us by the malice of a few pyromaniacs but rather our new normal. If we can track down and arrest these bad people, we can evade the facts we hate–that the fires are the very logical consequence of climate change, ill-advised urban planning, and our aversion to funding the infrastructure we need to fight the blazes effectively once they start. Some of San Diego’s institutionalized cognitive dissonance was captured nicely in one moment of live TV news I watched during the first day of the Bernardo fire during which the anchor in the studio comforted the audience with the unfounded assertion that San Diego has been trying to improve the infrastructure needed to respond to the fires. This was then was immediately followed by the reporter on the scene who informed viewers that the firefighters all said that they just didn’t have enough engines or other assets to fight the fire as effectively as they could. Needless to say, they just left that uncomfortable contradiction hanging rather than debunk the anchor’s Pollyanna-ish happy talk. The fact is that we have not done nearly enough to improve our ability to prevent and fight fires. As the VOSD reported last week, even Republican County Supervisor Ron Roberts laments the resources lost when the public failed to pass a countywide parcel tax to fund improved wildfire prevention and firefighting support. It is also hard not to marvel at the magic of how our firefighters, the very same unionized public sector employees that the San Diego right loves to hate during campaign season (whether they are calling for taking away their pensions or just bashing their unions in commercials to elect our current mayor) are seamlessly morphed into noble heroes when they are putting their lives on the line to save their fellow citizens’ well-being and property. It is a wonder to behold. 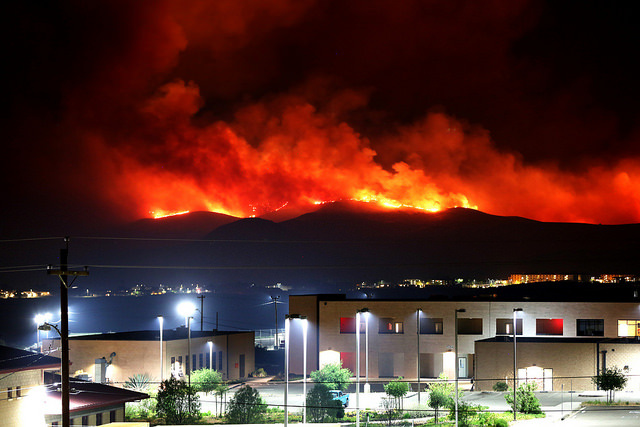 Across the western United States, wildfires grew bigger and more frequent in the past 30 years, according to a new study that blames climate change and drought for the worsening flames. Thus, the relevant and disturbing fact is that even if we are faced with a mythical army of arsonists bent on doing us harm, they can only do so because climate change has made a region already subject to drought and fire an even more dangerous tinderbox. [T]he Wilson legacy also includes an important, if more complex, responsibility for the pattern of urban growth in the San Diego region that now collides so catastrophically with wildfire. As a so-called liberal Republican, even “green” San Diego mayor during the 1970s and early 1980s, he was the chief architect of an enduring system of trade-offs, elite alliances, and sleights of hand that has simultaneously gentrified the downtown area at the expense of the poor and overrun much of San Diego’s countryside with pyrophiliac gated suburbs and elite estates — all the while winning accolades for state-of-the-art “growth management” . . . Meanwhile, the new fire cataclysm seems to be rewarding the very insiders most responsible for the uncontrolled building and underfunded fire protection that helped give the Santa Ana winds their real tinder. While conservative ideologues now celebrate San Diego’s most recent tragedy as a “triumph” of middle-class values and suburban solidarity, the business community openly gloats over the coming reconstruction boom and the revival of a building industry badly shaken by the mortgage crisis. And the Union-Tribune — like London papers after the slaughter that was the battle of the Somme in 1915 — eulogizes the very generalship (all Republicans, of course) that led us into disaster. Thus, while one would hope that the silver lining of yet another disastrous week of San Diego firestorms would be a wake-up call to start acting on climate change, rethink our brain-dead addiction to over-development in areas historically prone to wildfires, and realize that we need to overcome our tax phobia and really invest in the infrastructure needed for what will inevitably be a future of ever-more-dangerous fires, that seems unlikely. San Diego voted down a reasonable ballot measure aimed at restricting development in the fire-prone back country after the 2003 fires, failed to pass the ballot measure that would have funded increased prevention and firefighting after the 2007 fires, and seems averse to coming to terms with the fact that it is not arsonists that are our biggest threat, but our unsustainable way of life. The San Diego County Board of Supervisors is where good ideas go to die. These fires have been going on since the time of the Kumeyaay. Its not a matter of it will burn but when. Climate scientists have been predicting increased wild fires and drought for San Diego and the West since the 80s. Unless Bill Horn can get the FBI to arrest Mother Nature as an eco-terrorist I don’t think they will find a culprit. Is Gaia a Muslim name? Thank you for this well-written and in-depth article.